Lisa has been a professional makeup artist since 2015. Her passion is always to make sure every client is comfortable and leaves feeling absolutely beautiful! She specializes in both traditional and airbrush makeup. From natural to edgy, simple to sophisticated, Lisa will create a look that will compliment you. Lisa is a licensed esthetician. She has worked for MAC for a number of years where she was able to learn many different techniques. Dedicating 7 years of hands on experience in the industry, this Minnesota native is consistently fine tuning an encompassing range of abilities ranging from Beauty to SFX. 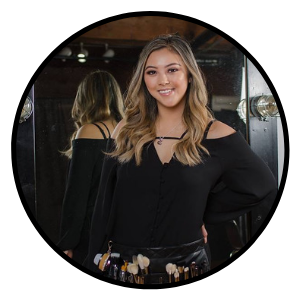 Sharpening her technical skills at Mac Cosmetics for the bulk of her career, Hollie has a proven ability to understand and exceed client expectations. Her spirited nature and superior attention to detail provides an experience tailored to satisfy the needs of folks of all backgrounds. Ashlee is a certified makeup artist with over 8 years of experience doing a range of makeup applications including bridal, fashion shows, and photography. Her love for makeup started at an early age and she always dreamed of being a makeup artist. Ashlee graduated from the Aveda Institute for Cosmetology in 2011 and started working for various cosmetics brands. To Ashlee, the most important part of any makeup application is making her clients feel beautiful inside and out. She uses her training in skin care, color theory, and advanced technique in order to achieve this. Ashlee is so excited to continue her career with LHNBEAUTY!